Living digital weeds of designer Simon Heijdens were growing in Platform21 as part of Checking Reality. 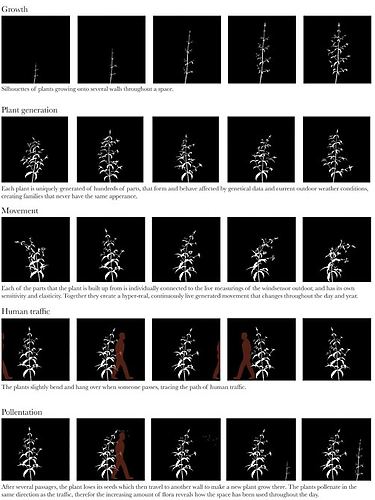 These fake plants reveal real nature: they react to the number of people in the room, while the flowers sway in the wind as it is measured outside and turn with the position of the sun. Lightweeds, a 2006 work by Simon Heijdens, is made up of live projected silhouettes: the plants are not drawn or animated in advance. They are uniquely generated by software and grow according to rainfall and sunshine outside and the presence of people and movement inside. These factors are measured by means of sensors. Nature outside is thus felt inside. At first, there are few lightweeds, but as the day goes on, they shed pollen and new plants begin to grow. Since the weeds’ growth, behaviour, pollination and death are determined completely by the room and nature, new combinations continually arise that are different every day. Lightweeds was bought by MoMa New York for their design collection in 2008. Simon Heijdens’ work is inspired by nature. In our day-to-day environment, nature is rarer and rarer. Air-conditioning and 24-hour fluorescent lighting are making the space we live in more and more artificial and timeless. In our designed environment there, is no place for a cool breeze, a sudden shower or a sunset, and a day’s natural timeline is lost. Simon Heijdens’ objects and installations respond to the nature immediately surrounding them. He gives them the specific characteristics of nature. Thus the objects’ colour and shape, and therefore the character of the room, change over time. Through sensors, living digital organisms allow us to feel the changing nature outside, thereby restoring a natural timeline to the space. Simon Heijdens graduated from the Design Academy in Eindhoven after studying experimental film. His final exam project, Moving Wallpaper, was immediately included in the Droog collection. His work is currently being shown at MoMA in New York. Enjoying the excitement of hacking? For other hacking ideas and much more, check out BRIGHT.